Two fishermen were rescued early Sunday morning after their 27-foot fishing boat sank off the Pacific coast north of Santa Cruz, Coast Guard officials said. A jogger on the beach near Wilder Ranch State Park told the Coast Guard about 6:30 a.m. Sunday that two men were stranded on a rock off the coast there, and that the two men called out to that jogger for help. 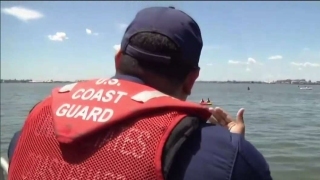 The fishermen had gone out on their 27-foot fishing boat earlier in the morning, and the boat had struck an object in the water not far from the rocks onto which they reached by swimming, according to Coast Guard Cmdr. Tim List, a Sector San Francisco search and rescue mission coordinator. An MH-65 Dolphin helicopter from Coast Guard Air Station San Francisco and a Coast Guard Station Santa Cruz 47-foot Motor Lifeboat went to the scene; the California Department of Forestry and Fire Protection and Santa Cruz Harbor Patrol also responded, the Coast Guard said. The helicopter crew arrived to find the stranded fishermen, and hoisted both men into the helicopter and transferred them to shore, where emergency medical personnel were waiting. There was no update tonight on their condition. "Life jackets played a pivotal role in the success of this rescue," List said. "Life jackets allowed these fishermen to stay afloat so they could make their way to the rocks and call out for help."